I realized that my last two substantive projects (sweaters, that is) were both knit in teeny, tiny yarn. Usually I’m a fan of a gauge that is smallish, but it just takes too darn long. And my hands ache by the time I’m seaming. I went back to an old fave, Rowan Big Wool. About 10 years ago, I knit a sweater in this yarn and I remembered that feeling of being able to finish not one, but two sleeves in an evening. It’s BIG. In a good way. Less than 2 stitches to 1 inch on size 17-19 needles. It’s like knitting with two broomsticks! But for a small project like a hat, a cowl, a scarf, even a vest, you’ll get that superhero feeling of making a garment in no time at all. 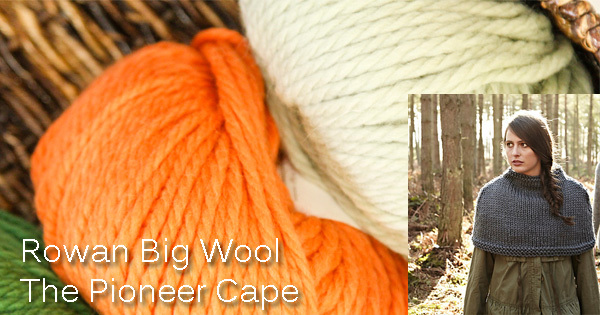 Big Wool is 100% merino wool, tightly plied, so it’s not fuzzy. A generous 100-gram ball gives the knitter plenty of bang for not a lot of bucks. 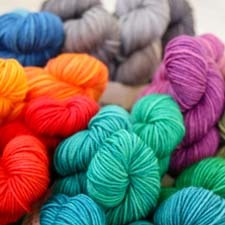 Even more enticing, when you buy 5 skeins of Big Wool, we’ll give you the Rowan Archive Collection Big Wool book FREE! Lots of great patterns that use this lovely stuff to its best advantage are in this treasure trove. Because I love the feeling of being wrapped up in a blanket, I might make the Pioneer Cape, a really smart shoulder covering that will stay in place, unlike a shawl or a scarf. The color palette is muted but expansive, giving you just the range you’d like for a conspicuous yarn like this. Now go, knit like the wind!